On the first Monday in October, Saint Lucians celebrate Thanksgiving Day. Although it is a public holiday, its celebration is quite low-key. Most islanders simply enjoy the extended weekend, spending time with their family and friends. Saint Lucia is a small island country in the Caribbean. It is located not far from Barbados, Martinique, and Saint Vincent. Originally it was a French colony, but in 1814 it fell under British rule according to the Treaty of Paris. Saint Lucia became fully independence from the United Kingdom in 1979. 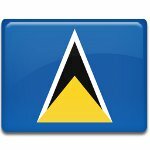 As any independent state, Saint Lucia has its public holidays, and Thanksgiving Day is one of them. It is a day of giving thanks for the blessing of the harvest. It originates from ancient autumn harvest festivals. In different countries, Thanksgiving Day is celebrated on different dates. In Saint Lucia, for example, the holiday is observed on the first Monday in October. Saint Lucia's Thanksgiving Day is not particularly popular among the islanders, many of them don't even known what the day is all about. Most of Saint Lucians see it as just an extra day off. Many businesses do not close for the day, despite it being a public holiday.